What is clean energy and how is it relevant to Trinidad? Clean energy can be referred to as energy or electricity which is produced without directly polluting the atmosphere. For example, energy produced from the sun like solar or wind, hydro, geothermal, etc. What were the outcomes and action items from the conference? The conference this year in my opinion, definitely brought a greater level of positivity and momentum. Things are definitely stirring up. It helped to empower others with the necessary information and in creating good networking opportunities. There was a greater sense of urgency with actual examples of efforts being made both in the private and public sectors to allow the implementation of clean energy in Trinidad and Tobago, the region or internationally. Key action items that stick out are continued work on getting policies amended/approved from the various government entities and efforts to reduce greenhouse gas emissions etc. on a national level. What are 5 concrete things we can do now in Trinidad? It always begins with us, on a personal level, so I’ll say look at reducing your electricity consumption in your home i.e. increase energy efficiency (and there are many simple ways of doing so including looking at the energy vampires like plug loads, cable boxes etc.). Also, try to reduce or eliminate the use of single use plastics like plastic bottles, bags, cutlery etc. and create a culture at home which encourages composting and recycling. Continue to create strong networks and get involved in an organization that is on this mission, continue learning, volunteer (give back) and help empower the youth, they are our future! How is clean energy related to green tech and clean tech? I believe this was heavily debated about a decade or so ago? In my opinion, each green or clean technology solution brings with it a certain carbon footprint. What we need to look at is the entire lifecycle of the technology implementation and work on continuous improvement and combine with other initiatives that can help create a Net Zero Carbon future by 2050 i.e. zero greenhouse gas emissions by 2050! This is the only way we can ensure global temperatures do not go above 1.5 degrees celsius pre-industrial levels. Do we have research happening at the university level in the area of clean energy? There is, I know for sure that The Arthur Lok Jack Global School of Business has a MBA program in Sustainable Energy Management where their students are actively involved in research in clean energy solutions etc. and are looking at it from various angles eg. technical, economic, social and environmental. The University of the West Indies and UTT I’m sure are also working on various initiatives as well. They’ll be able to give you more specifics. 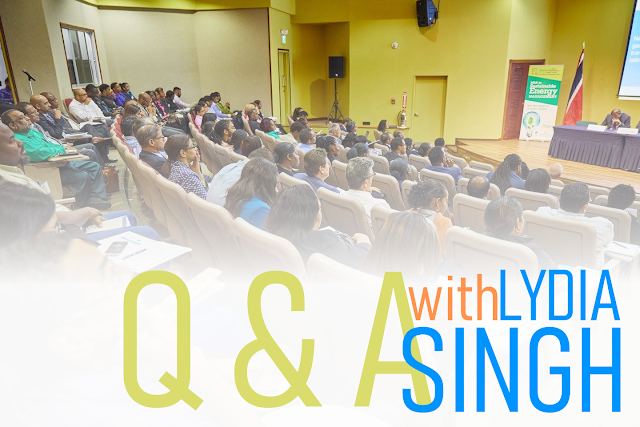 What are the challenges for us in Trinidad? Mindset, culture, complacency, many still aren’t aware that Climate Change, air pollution, loss of biodiversity etc. directly affects one’s life and the life of future generations. It may also be a matter of life or death for islanders like ourselves on small island developing states. There’s a greater need for the creation of enabling environments at all levels to drive this change. "The best way to predict the future is to create it". I’ll like to encourage everyone, young and old, to start making small changes within your own lives, every small act makes a huge difference... help empower each other and become an inspiration to others to help create that future we all dream of and rightfully deserve!